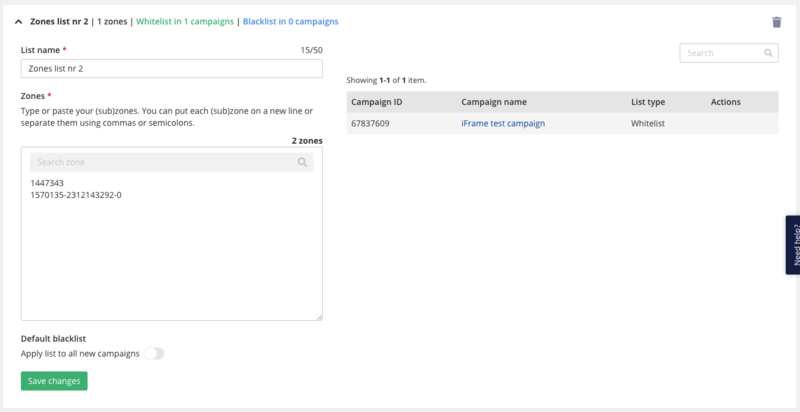 Zones List is a collection of zones/sub IDs that can be applied as a black- or whitelist to any campaign. Zones List can also be automatically applied as a blacklist for each new campaign (default blacklist). You also have an option to activate a default blacklist that could be applied to all new campaigns. A campaign can either whitelist or blacklist Zones Lists, not both at the same time. Click into the text field to see a dropdown list of zones or click on "New zones list"